Although most of our recent winters have being rather damp and un-snowy affairs driving conditions have been fairly decent as far as winter driving conditions go. Until this week I thought this winter was going to be the same. Until I awoke on Thursday morning to a good inch of snow. After making a snowman and throwing snowballs at the neighbours I had to go to work. Real winter driving at last, and I know just how to handle the treacherous roads. Check the car is ready for the wintry conditions. Be sure to check antifreeze, lights, wipers, tyres, battery and the general condition of the car. Before you set off make sure you have properly defrosted and de-misted all the windows of the car. Visibility can be reduced anyway by poor weather conditions a fogged up windscreen just makes things worse. 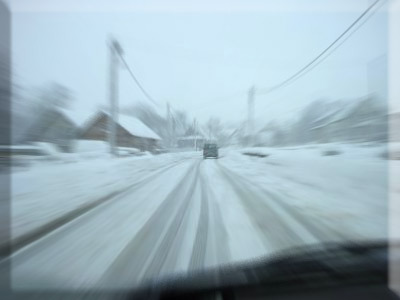 When driving on slippery roads, drive slowly, smoothly and gently - accelerate gently, steer gently and brake gently. This is easier said than done when the idiot in front slams on his/her brakes when they start to slide. So remember to leave more room in front of you. If you have a rear wheel drive car put some sand bags in the boot to give you extra weight over the driving wheels. (TIP: You can also use the sand to put down for extra grip if you get stuck). Remember to tell someone where you’re going, what route you’re taking and what time you’re expecting to arrive at your destination. Make sure you have a full tank of fuel - this will allow you to keep the engine running for warmth (through the heating system), without fear of running out of fuel, if you get delayed or stuck. Carry warm clothes and a blanket to keep you warm if you get stuck. A bar of chocolate could also come in handy (I find this is true for most journeys, in the winter or otherwise). Carry de-icer fluid, a scraper, jump leads and a tow rope. Pack some pieces of old sacking, or similar material, which you can place under the wheels to give better traction if you get stuck. The most important advice is that if the weather is going to be bad stay at home unless the journey is absolutely necessary or an emergency.